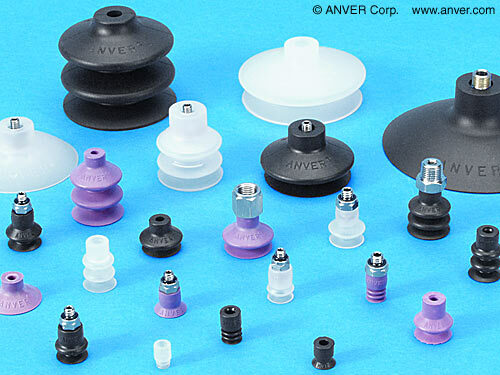 A full line of vacuum suction cups with interchangeable fittings that are ideal for a wide range of product transfer, material handling and packaging applications is available from ANVER Corporation of Hudson, Massachusetts. ANVER Universal Vacuum Suction Cups come in flat, single- and multi-bellows configurations from 5mm to 95mm (0.20” to 3.74”) diameter and use interchange-able fittings. Featuring 36 body styles, they are available in a variety of rubber compounds including long wearing Nitrile and translucent silicone for chemical, food and high heat applications. Easily matched to the product being lifted, ANVER Flat Vacuum Suction Cups are designed to handle flat or slightly curved surfaces and offer fast attach and release; ANVER Single (1.5) Bellows Suction Cups compensate for product irregularities and varied heights; and ANVER Multiple (2.5) Bellows Cups extend the capabilities of single bellows for horizontal lifting.